odge the ramp outside Dwinelle and cover your ears; there’s a mechanical pounding sound from inside the fence around Wheeler. The Moffitt Library renovation is finally complete, so you’re probably safe from the sights and sounds of construction there — but head too far in any direction and you’ll run into the renovations of the Haas North Academic Building, or the construction on Berkeley Way, or the new residence hall going up on Bancroft Way. To the wandering eye — or ear — it can seem like there’s a lot of construction on our campus. But according to UC Berkeley real estate spokesperson Christine Shaff, there are fewer capital improvement projects now than there were 15 years ago. 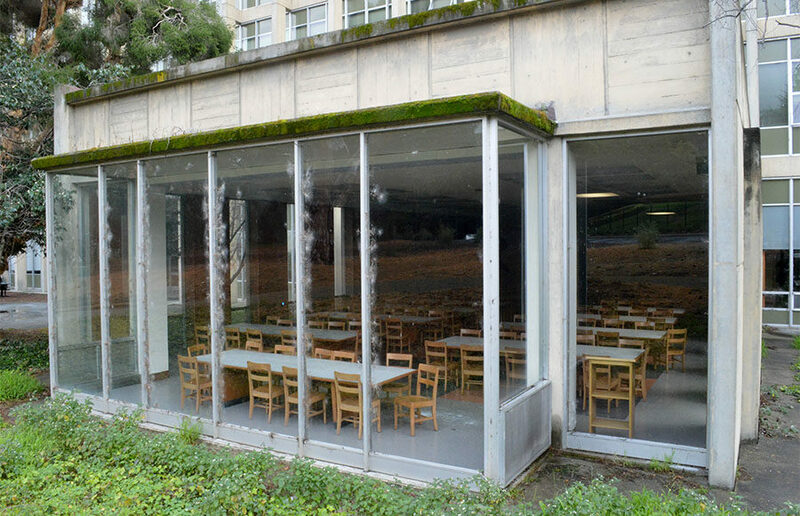 UC Berkeley holds the dubious honor of being the only UC campus with buildings directly on top of a fault, according to Nicholas Sitar, campus professor of geotechnical engineering. Hayward Fault, described by the United States Geological Survey in 2008 as a “tectonic time bomb, due anytime for another magnitude 6.8 to 7.0 earthquake,” runs right under Memorial Stadium. Major earthquakes in Southern California and Japan during the ’90s served as a wake-up call for the campus by showing the damage earthquakes can do to major educational institutions, Sitar said. UCLA, the University of Southern California and CSU Northridge had to shut down because of the Northridge earthquake. In 1997, the university hired a task force of engineers, including Sitar, to rate the seismic safety of campus buildings. Fifty-seven campus buildings — about 27 percent of campus space — were rated poor or very poor, meaning that they posed an “appreciable” or “high” threat to occupants’ lives in the event of a major quake. Prioritizing seismic safety comes at a cost. From 1997 to about 2010, all campus capital funds — funding for buildings and physical space — were used for seismic-safety improvements, according to Shaff. But earthquake retrofits are still in progress. “That library is probably the worst place to be in an earthquake,” Sitar said when I told him it used to be my favorite study spot. According to Sitar, Tolman Hall posed a greater seismic risk than the team initially realized. But the hall is still in use because replacing any campus building is a complicated multi-step process. “The first step was all classes were moved away so that you didn’t have large numbers of people — the probability of somebody being injured or killed decreases,” Sitar said. While Berkeley Way West is still under construction, faculty will continue to use offices in Tolman Hall. Only after the new building is finished will old Tolman Hall be demolished. According to Sitar, moving people from offices in one building to offices in another can cost half a million dollars. Since 1997, the campus has spent $1.2 billion on seismic safety improvement projects, Shaff said in an email. And the campus hasn’t completed all the seismic retrofits that were identified because of lack of funding, Shaff said. When it comes to funding capital improvements, “the campus has gone through a huge sea change,” said Catherine Koshland, vice chancellor for undergraduate education. Until the early 2000s, the UC system received state money from general obligation bonds for capital improvement. UC Berkeley received about $30-50 million for construction and other capital improvement each year, Koshland said. The state also provided money for maintenance and operations. The UC system no longer receives state money from general obligation bonds. “It’s now a situation where one needs to make strategic tradeoffs. It means we’re really responsible for looking at the entire landscape in a time of constrained resources,” Koshland said. State funds were always limited to academic buildings. Other projects, such as athletic spaces, are funded largely by donors and revenue, while student housing is funded by the rent students pay, according to Shaff. In the absence of state support for construction, the campus must focus more on other sources of funding, such as private donations and other types of bonds. Some funding comes from student fees. A semesterly $46 fee approved by the UC Board of Regents supports seismic-safety improvements for campus buildings, and another $150 goes toward the Lower Sproul project after students passed a fee referendum in 2010. Campus capital improvement is also funded by borrowing. The Lower Sproul project was funded by debt services — half from the student fee and half from campus funds. But now, UC Berkeley has no more debt capacity. “The campus has reached its maximum ability to pay back a loan, in super simple terms,” Shaff said. The new student housing project replacing Stiles Hall on Bancroft Way will be funded through a public-private partnership — a developer is fronting the construction costs and will make back the money through student rents. Rigel Robinson, chair of the ASUC Real Estate Student Board, said housing access is a “flagship conversation.” The campus began housing first-year students at Mills College and Holy Names University last fall because, like money, campus space is finite. Northwest of campus, on the corner of Virginia and Walnut streets, lies a plot of plants behind a chain-link fence with a hand-painted sign: the Student Organic Garden. Nearby greenhouses hold research facilities. Together, this land is the Oxford Tract, and the university plans to turn it into dorms. Proponents point out that the project will house between 1,000 and 3,000 students. UC Berkeley currently faces a housing deficit of 7,000 beds. And according to the campus’s 2020 Long Range Development Plan, the campus hopes to one day guarantee two years of housing to campus freshmen, rather than just one year. What do you do when multiple campus interests collide? “There’s absolutely a lot of nuance to the issue there, (but) I don’t think it’s hypocritical to simultaneously want affordable, accessible and sufficient housing but also insist that that not come at the expense of our academic programs, the reason the university exists,” Robinson said. Both Robinson and Matthew Lewis, RESB member and chair of the ASUC Housing Commission, criticized the decision to develop the Oxford Tract in light of other university developments, particularly the new aquatic complex for student-athletes and the planned 10-story hotel on University Avenue. Campus junior Grace Treffinger, who recently became involved with the effort to preserve the Oxford Tract, said that although the Oxford Tract development is expected to house the most students of all the sites the university has proposed for dorms, she felt that other potential sites had not been adequately considered. Treffinger said though the campus had reached out to College of Natural Resources students to join a committee to ease the Oxford Tract transition, students still should have been asked whether that land should be developed at all. “I very strongly don’t believe there’s been enough (student) input,” Lewis said. “Right now, the university selects sites … without consulting with students.” He added that it’s difficult for the RESB to meet campus administrators regularly. Elle Lam, another RESB member, disagreed. “They make a very strong effort to include student voices within housing operations and residential affairs,” Lam said, adding that campus students may reach out to members of the RESB with questions or to offer their input about real estate on campus. Land is finite, but the student population is on the rise: The campus admitted 750 additional students in fall 2016. As the population of California increases, so, too, will the population of the UC system. And with that growth comes challenges for student housing and academic space.